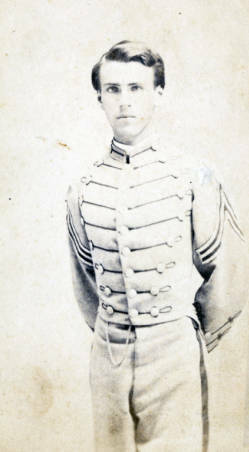 Biography & Genealogy: Nicholas James Bayard, Class of 1867: New Market Cadet; Private, Co. B. Genealogy: Born- March 26, 1848, in Roswell, Ga. Father- Nicholas J. Bayard; Mother- Eliza Barrington Hand, a widow when she married Bayard. Pat. Grandparents- unknown. Mat. Grandfather- Roswell King; Mat. Grandmother- unknown. Married: Grace Battey. Children: 1st- Julia Barrington (Holland); 2nd- Nicholas Ralph Bayard. Careers: Druggist-Orange Grower.